Originally discovered in 1878 not much is known about the Black Microhylid Frog as no studies of the species have taken place since before 1997. The Black Microhylid Frog is unique in its part of the world – India, and is currently listed as endangered due to threats from the expansion of coffee plantations and human expansion. This incredibly rare frog prefers a mountainous habitat in the tropical forests and can be sound on ground level where there is plenty of natural foliage to use as cover. The Black Microhylid Frog is easily recognizable with its distinct coloration of black and deep red. The top of the frog is usually completely black with a lumpy, warty texture. In comparison the underside is slighter lighter and much smoother, occasionally deep red blots of patches can be see. The most distinguishing feature id the deep red stripe that runs along the frogs upper thighs. 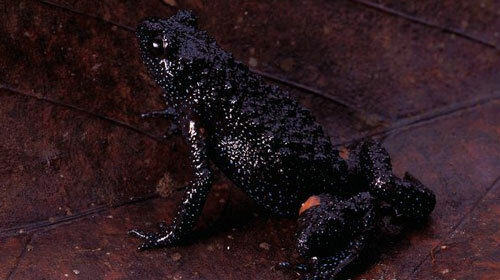 The limbs of the Black Microhylid Frog are very short and are not webbed at all. Interestingly although frogs of this type usually have powerful mating calls the Black Microhylid Frog doesn’t even have a vocal sac. It is believed that the Black Microhylid Frog’s diet is made up mostly of small invertebrates and insects however as not much is known about this species more information is needed to confirm this. I s known that breeding takes place within the local streams and males have been reported with very weak mating calls. I found a small frog in the garden. Pitch black with two red stripes doen the back?